If a person is motivated, has enough ability, and a trigger is presented at the right time, it’s highly likely that that person will perform the task you want them to perform. If you follow this formula. If you missed part 1 you might be interested in reading that one first. 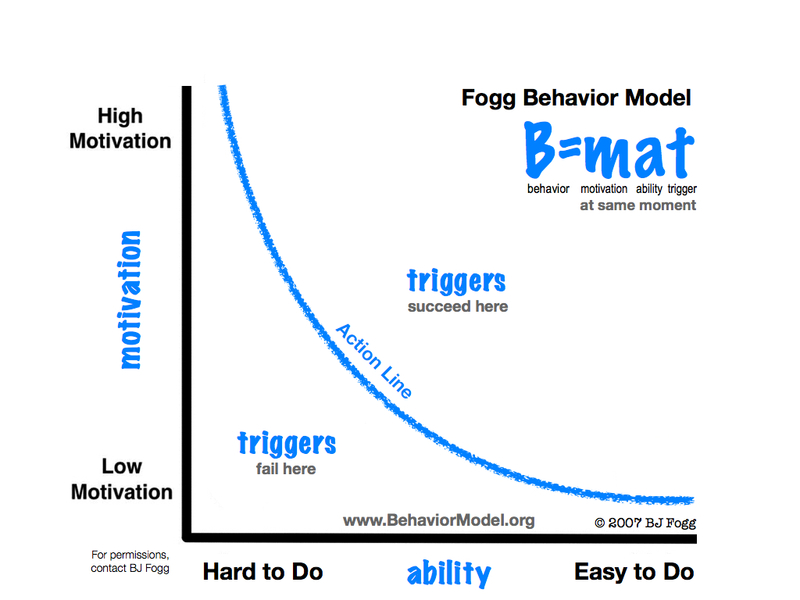 Fogg’s model emphasizes something called the behavior threshold: providing a trigger above this threshold will have a successful outcome, providing it below the threshold it will fail as indicated in the image below. When the combination of motivation and ability places a person above the behavior activation threshold, then a trigger will cause that person to perform the target behavior. If a person is underneath this threshold, then a trigger will not lead to the target behavior. The activation threshold could be illustrated as a curved line sweeping across Figure 1, from the upper left corner to the bottom right. 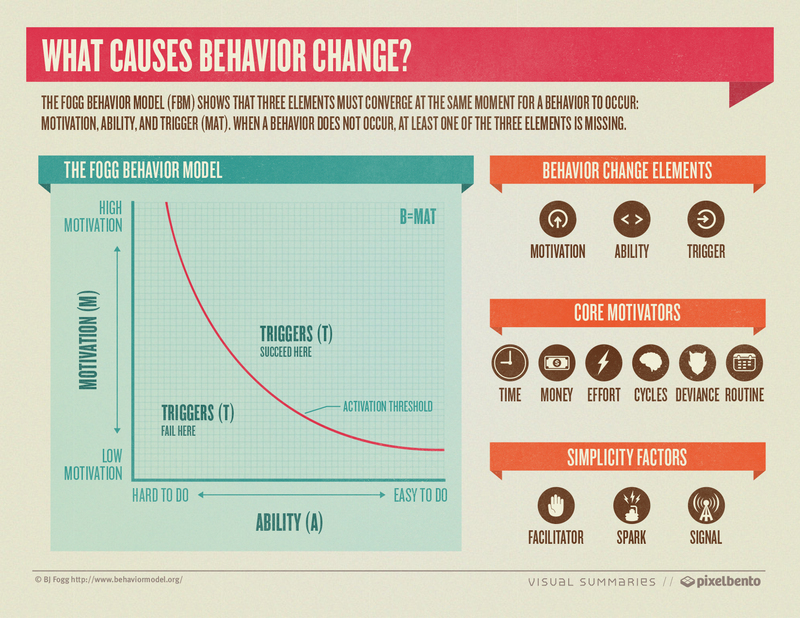 Fogg’s advice to maximize effectiveness in behavior change is to put hot triggers in the path of motivated people. Hot triggers allow the user to accomplish the task immediately, as opposed to cold triggers, where the user doesn’t have this possibility. The idea here is to first start with motivated users. If we want to perform a behavior, a well-timed trigger is welcome. But when our motivation is low for that behavior, a trigger is distracting. Conversely, when we want to perform the behavior being triggered but lack ability, we feel frustrated. Once a trigger is in place, it is possible to create habits. In persuasive design, the opportune moment is the instant a person is most likely to comply with your intent. Motivation is traditionally very hard to influence simply because changing people’s mind is tricky and motivation is therefore hardest to affect. Marketing budgets usually are focused on influencing attitudes, although we know that people often time don’t know why they are behaving in a certain way. We humans naturally love simplicity. Ability is the easiest element to manipulate in order to influence people’s actions. It is possible to drive action – even when users’ motivation is low – just by making it easy. This is vital and explains why simplicity is so important in design. By removing complexity you can persuade people to change their behavior, because it doesn’t cost them much. Make tasks simple and in general people will do what it is you want them to do. Simplicity is not about less, it’s about better. 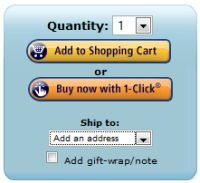 Amazon “1 click” shopping service makes it easy to spend your money! When we see patterns of behavior changes in other settings, it is often possible to re-apply these in most settings. Another way to find patterns is to look for workarounds and shortcuts people orchestrate (sometimes unconsciously) to achieve a goal. People do this to handle imperfect situations or environments. Therefore behavioral observation is so critical in UX Design. For the desired behavior to occur all three elements have to be present at the same time. Influencing the ability to perform a task is our best bet in changing behavior. Triggers need to be placed at the right moment to be successful. Even when motivation runs low, if the task is simple a user is more likely to complete it. I dig the article but the last visual (I know it’s not yours) is incorrect. Core Motivators = Hope/Fear, Pleasure/Pain, Acceptance/Rejection. Simplicity Factors = Time, Money, Effort, Cycles, Deviance, Routine. Facilitate, Spark, Signal are types of Triggers, not Simplicity Factors. You’re right! Thanks Taylor for pointing out the mistake and for sharing the reference! Next Next post: Is Oslo recruiting foreign talent?